HOW CAN YOU CLAIM HAPPY? After I made the “WANTED HAPPY” poster, I decided I wanted to place it everywhere. It was a poster that spoke to me and the way things are going in the world, I wanted to say something positive. I wanted to put a message out there that might cause people to think. As an artist, I wanted to contribute something more than an art piece. I wanted to do something more. So the poster gets designed and I get a bunch of stickers printed. As I went from town to town putting up my contributions to the world, I started thinking about my own actions. I thought about all the times I wasn’t happy and all the mean things I had done to others. I started to question my qualifications. Who was I to be spreading happy? In the past few years I have gone through many changes. Things of my past no longer haunt me and the things I’ve done, or things done to me no longer live in me. I have let it all go. Many lessons have given me the chance to look at myself and decide how I am going to live my life. If I was always looking at the past, I would not be available for the future. Douring business hours,I would be running around, on my way to do my chores, placing posters on poles, I started making a focused effort on being happier. I decided to interact with people more. Smile and chat with them. I wanted to be the happy I was wanting others to experience. I felt it was my duty to be a better person a happy person. So that’s pretty much what has been going on for me. I have made more plans to spread this happy thing. So in the next blogs I will tell you the next part of my process. Every artist tries to find the new or next creation. After working with art for over 4 decades, I have tried to follow my create interest, no matter where they may lead. I have been fascinated with the art of communication, the messaging combined with design. The use of words mixed with graphics can capture the attention of others in a matter of seconds. People will sometimes walk right by a painting or piece of artwork, but will stop to read a poster. The poster in many ways has the same aspects of a painting. They both have color; design layout; movement; a message. For years I have been doing series, dealing with the mixture of art and advertising. It started around 2000. I was living up in Northern California in a small town. Being new to the area, I would look at the bulletin boards on a regular basis for possible jobs. I would also create wanted posters advertising my talents. I would do a few different designs and advertise various trades. Some would be for house painting; graphic design; sign painting; or even faux finishing. As I got use to viewing the boards on a regular basis, I saw a pattern of events and posters being placed by the same people. It was like a community of people all participating on the same playing field. And just like in life, there were polite people that would try and place their ad in a spot that was open and then there were people that did not care what ad they placed their poster over. When pinning a poster or flyer to a bullpen board you had no supervision. Nobody would be paying attention to where you were putting the flyer so it was up to the individual to what they would do. Also, boards are placed all over a community. They will be next to small stores and coffee shops. Sometimes they will be on the side of a building in an obscure area. But the same people used them all. As I placed flyers all over the town, I noticed all the other people on the other boards followed this poster path as well. They were like my friends and then in some way my competitors. You see in the ad world the important thing to do is to make your product stand out from the others. And if you cannot see it in the first few seconds then you would loose the customer to another product. If you think about it a bulletin board is a place where everyone competes for attention. There are different products, service and various events but to the viewer, it will be the most powerful flyer, the one that catches the eye. That will be viewed the most. So everyone on the board is trying to get your attention. I soon realized that with all the different services I was offering on any given board there would be about 5-7 flyers of posters advertising me. A friend in passing mention to me jokingly, Hey Brino saw your post on the bulletin boards…you running for mayor? It was at that moment I realized that there was an art project to do on this. My series would be on how could I create art out of a random bunch of collective flyers placed on community boards. I found a wall by a bus stop and it looked like a good place to start a bulletin board. I went to my files and retrieved all the old flyers I had ever made. I also gathered some old art invitations from my gallery in Los Angeles. I took the stack of random pieces of paper and placed them all over the wall creating what looked like a new bulletin board. But it was a fake one that only contained messages from me. In time other people came and placed their flyers on the board. A new community had been established. Since that time, the computer has become an important part of this creative process. My interest in graffiti, particularly stencils also added to another level in this series. One of my series that addressed the issue of competition on the bulletin board was called, “You’ll Read This”. I stenciled the words on a 22”x 28” poster. After that I added embellishment to make it an original piece of art. I then placed them all over the county on every board I could find. Over the course of the next few months I would check to see if the posters were there, covered up or taken. All of the fore mentioned happened. On many levels graffiti and advertising are the same. Both are trying to capture the eye and send it a message. Both are unexpected and not asked for. The viewer just happens to be there when the message is delivered. Many graffiti artist have taken the art to political and social levels. Advertising has driven movements and created desires. Between Andy Warhol and Banksy, the juxtapose of art meets life or art meets thought. But both delivered in a way that could be accepted of even marveled at by the masses. This mixture was taken even further by the use of characters and logos. Aftermarket products and shows. Games and cults get born and trends can be set in motion. A singer can also design clothes or an actor getting into politics. Look at the recent rock stars that have become royalty. And then there are sports. Talk about a mass media of art, fashion, graphics and performance all rolled into one. At this point I have to back up a little because this project is also combined with politics and the condition of our planet as well as all the living things on it. In all my work as a humanitarian clown traveling to places tourist don’t go, I saw the real lives of the other less fortunate folks. But then living in America, the land of opportunity and fulfillment of all your dreams, I met folks that seemed less happy than the disadvantaged folks living in third world countries. I meet people that are bored and have no dream. They seem to go through the motions of daily life so they can get back to their house or their friends. People go out in the evenings and try to socialize but never really seem satisfied or really fulfilled in those deep desires. Situations seem to haunt everyone in the secret life. Their thoughts of aloneness or trapped. Lives that seems hard or stressful. I see folks going out and doing all kinds of things to try and break their pattern, to go beyond their dullness and try to live. But then on Monday morning they dress up in their work face and go pretend they are interested in doing a job that only keeps their rent paid and possibly a vacation…if no unforeseen expenses arise. I know you think I have really digressed this time but I am getting to a point. And with what I’ve said to far, you might think I am being judgmental or hard on us Americans. I don’t want to paint us all in the same boat. But I do see a lot of pan in the eyes of people around me. I hear stories of how they are trying hard to keep it all floating. Everyone is just trying to get by. I too have been trapped in this system…until about a year ago when I quit my job and decided to live a simpler life. I decided to lower my cost of living and stay out of debt. I also retired from a rock band that had me out in the public all the time. This gave me more time to work on my solo projects and try and conceive the next mission I was to be involved with. In the last few years I have been getting more and more concerned with the condition of our country. I see people desperate, police shooting innocent young people and schools that are like a war zone. The weather has gotten freaky and bad storms pelt the country with everything it has. It seems like there are more people out of work than the government states and everyone is sick and tired of a war going on somewhere. It just doesn’t seem like a happy place around here. I feel the vibrations of people in passing and I can tell some folks just want to scream. Many other folks just try not to think about it. That’s when it hit me! I recently did a stencil with my face on it. I was teaching a class for teens called “Urban Spray Paint and Stencil Art”. It was in that class that I cut a stencil of my clown face and the words “Wanted Happy” It was a simple but direct graphic. At the risk of sounding egotistical, it was a brilliant piece. It had all the elements of good art and great advertising. I decided to print posters of it and place them around the county. This time I didn’t go to the bulletin boards, I stapled them to telephone poles on out of the way roads. Mostly rural roads and the edge of the city. I put them in places that they would easily be seen from San Francisco to Eugene, Oregon. They looked great and I even had a few folks come up to me and tell me they saw them. I then decided to have some stickers made so I could get them in the hands of others , that way they would get out in the world. That’s when the next part of this hair brain idea developed. What if I set out across America trying to spread happy? An effort to bring a happy into everyone’s day. I know it seems like a weird thing but after decades of clowning and performing I feel that maybe I can go out there and help others to be “Happy”. I’m not saying I have the answers to happy but I do know that I can create a space for you to. I saw the reaction of people to my sticker message. Most everyone liked it and that encouraged me to take another step. I bought a vintage travel trailer and renovated it to carry me across the land. I am not sure how it will all happen but I am doing everything I can now to prepare for the maiden launching Spring of 2015. I am working hard to use my talents to finance my trip. I will perform, paint and politic to do this. It has become my new dream and vision to do something. This isn’t a world changer or a solution to our problems, it is my way of doing something, anything. If I can bring joy to people or create a smile for a moment then I feel pretty good. I am not a person that has ever done anything big, I’ve never lead a movement of accomplished a great deed. I have spent my life on the street level with people using my talents on a local level. I have been apart of movements but I didn’t start them. I am not trying to start a movement now; I’m just trying to bring a happy moment to a person. To you. Or to anyone in need. My dream does include you. You can be apart of this movement if you help me by buying my “WANTED HAPPY” stickers. I would like you to consider purchasing enough so that I may go pass them out. I would also like to have a few sponsors that might be willing to invest in my gas to go out onto the plains and mountains of our nation and try to spread this happy idea. It may sound foolish and a bit idiotic but it seems like a good idea to me. I am doing this with or without help from anyone. I will work to finance myself and the printing of stickers. I will buy my own food and gas to get to these places if I have to. I am prepared for this and will take it on myself to fulfill my vision. But if this inspires you in any way, I would gladly accept your donation. This is a World Peace Clowns, a non-profit for nasal diplomacy project. I am running this project through my organization and would love to have other organizations get involved with me. If you have an idea or a place for me to go; if you want to help or donate money, please contact me with your ideas. 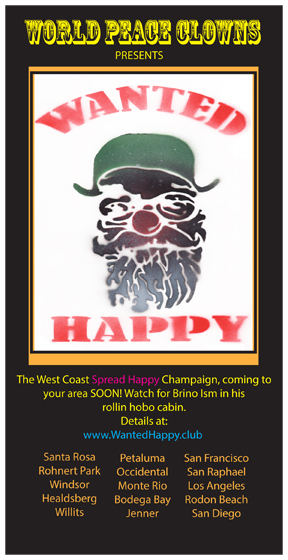 Please stay tuned to my blogs and videos soon to be coming out…and watch for the posters in your hood…SPREADING HAPPY! I have almost finished my rollin hobo cabin. There are small details and embellishments to complete before I can get it fully on the road. But that isn’t stopping me from continuing on the path to spread happy. I recently received a photo of a lady in Peru giving thumbs up to a Happy sticker on a pole in a village called the Sacred Valley. I now have the cabin settled under some redwood trees on a small farm. The single mother that lives there needs some help this winter with chores and wood splitting, so I am camped there for a few weeks to help her out while I get the last things done to my rig. I will be shoving off for a quick trip in a week to go Northern CA. Taking small trips will allow me to get a feel for the road and how I will be received in communities. I have talked with other RV Boondockers to find out what their experiences are like on the road. It seems that people frown on RV Bums. I am going to test this theory with my positive attitude and a song. I hope that by bringing a positive message to strangers will bridge a gap. I want to see if I can transcend the taboos of wandering hobo and create new bonds with strangers. I will find folks that need some help or I will volunteer my time in order to create this moment all the while I will be posting my WANTED HAPPY posters and stickers. If you would like to help me in this effort please contact me. I am in need of stickers and would like others to sponsor me in this effort. More to come! Spread Happy!! This last week we have seen the forces of nature. My heart goes out to all the people of Japan. I hope that the effort of the world community will help with a speedy recovery. I would like to donate 20% of any sale of a painting for the rest of this month to help in this relief effort. Stolen Art by Brino is not a crime he (I) will be arrested for. You see the crime is based on the damage to the victims. In the case of stolen restaurant napkins, Brino has created some of the most interesting pieces of artwork seen in the tagged world. Cloth napkins are used in all five star diners. Nobody thinks a thought when they wipe their face after a sloppy bite of beans, but would they care if you drew on their property... a napkin? The next opening will be the last Sunday of this month. Sunday Salon will be every last Sunday of the month. All galleries will be open in the SOFA arts district. This Saturday night will be an opening of Small Works at studio ISM. I will be showing artwork that is smaller than 12" x 12". and under $250. All the galleries will be open from 5-8pm. There will be a great art opening tomorrow at 6:pm, Hammerfriar Gallery, Healdsberg, CA. My art isn't in this show but the artist showing are friends of mine. There was a flury of art blown out on the wall outside my studio late last night, then we went for walks in the danger zone, art is sometimes very dangerous. 2011... This is the year for art, I know that the artist of the SOFA district will produce some great shows this year. I have been working with some of the best artist to come up with themes and concepts that will bring art into the next new development. The last sunday of the month in all of 2011 will be the openings of all the SOFA galleries. 2-5 pm, you are invited. The new year approaches and I am excited about the events that will be happening here in the SOFA district. Look for galleries to be open the last Sunday of the month from 2-5. All artist will be participating in this event, and I will have some off the wall emerging artist participating in my studio. The graffiti wall outside my studio is always emerging. I have been practicing the art of painting/ drawing for over 48 years. In that time the endless series I have produced have been a winding road of related shapes and colors. What I mean by this is as I look at my works of art, I can see the relationship between them from the first piece until now. As a lifelong painter, I can feel the brush as an extension of my hand. The accuracy I feel as I apply the layers that make up my composition are effortless. I find that I’m in a state of alertness without much thought. I react by instinct and never labor very long on what I will do next. It is more of a feeling ; a place that visually feels right. In the past few years with the onset of teaching art to incarcerated youth, I have seen a vast improvement in my artwork. Every day as the students settle into their personal art projects, I too would indulge in a painting or drawing. It was like being back in college in that I was practicing art. I was not really doing art for sale but more exercising my abilities. As a result a new series has emerged. This new series is by far my best work and I feel that I am just now starting to become an artist.